Episode 1: Management of the Colorado River (Doug Kenney) - In this episode, we take a broad view of the Colorado River Basin, exploring how the river is managed, who uses the water, and what a potential shortage could mean for the system. Our guest is Doug Kenney, Director of the Western Water Policy Program, a division of the Getches-Wilkinson Center for Natural Resources, Energy and the Environment, at the University of Colorado School of Law. 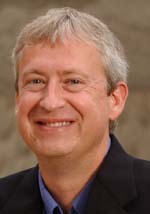 Doug Kenney is Director of the Western Water Policy Program, a division of the Getches-Wilkinson Center for Natural Resources, Energy and the Environment at the University of Colorado School of Law. He researches and writes extensively on several water-related issues, including law and policy reform, river basin and watershed-level planning, the design of institutional arrangements, water resource economics, and alternative strategies for solving complex resource issues. Dr. Kenney has served as a consultant to a variety of local, state, multi-state, and federal agencies, including several Interior Department agencies, EPA, the US Forest Service, and special commissions (e.g., the Western Water Policy Review Advisory Commission); and national governments and non-governmental organizations in Asia and Africa. Additionally, he has made presentations in (at least) 19 states (and the District of Columbia), 7 nations, and 4 continents.